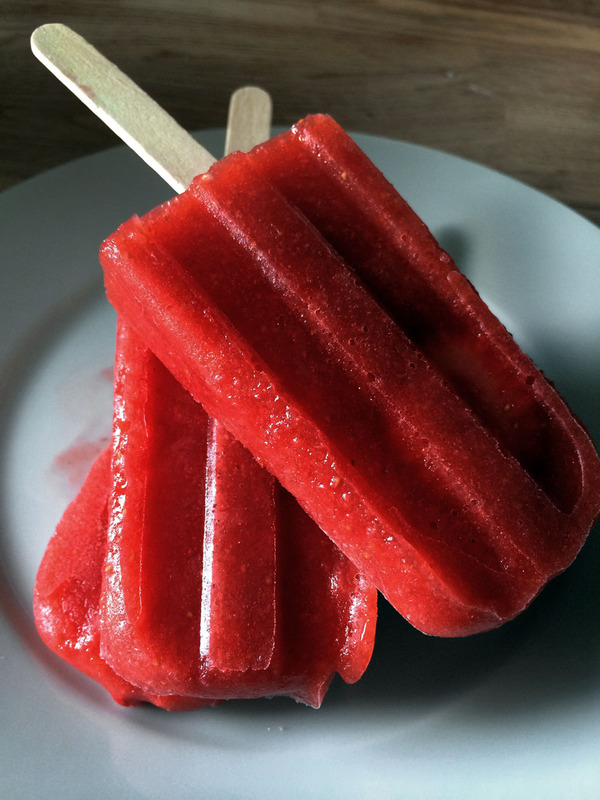 Strawberry Paletas. Because I wish I was in Tulum right now. STRAWBERRY PALETAS (ICE POPS) Adapted from Peoples Pops Recipe. Slice three to four strawberries into thin strips. Puree the remaining strawberries in a blender. Use as much simple syrup (sugar) as you prefer. If your strawberries are sweet enough, you may not need any. You should have about 2 cups puree. You can sift the seeds out in a mesh strainer, or leave them in for a more rustic pop. Add simple syrup, lemon juice and lemon zest. Adjust sweetness to taste. Pour the mixture into ice pop molds. Add strawberry slices. I use these molds. Leave about 1/4 inch of space at the top of the molds for expansion during freezing. Freeze for about 1 hour, then insert ice pop sticks- this helps them freeze straight. Freeze for another 4-5 hours or until solid. To unmold, run under warm water. Wrap pops in wax paper or plastic bags for storage or serve immediately. Pops will keep for about 2 months before losing flavor. *To make simple syrup, dissolve equal parts sugar and water in a pan over medium heat. As soon as the sugar dissolves remove from heat. Be careful not to burn the sugar. You can make a large batch and store in the fridge for use with recipes, iced coffees, iced teas, etc. NOTE: For this recipe you would use 3/4 cup water and 3/4 cup sugar.